Le Tour de Fleece has begun. 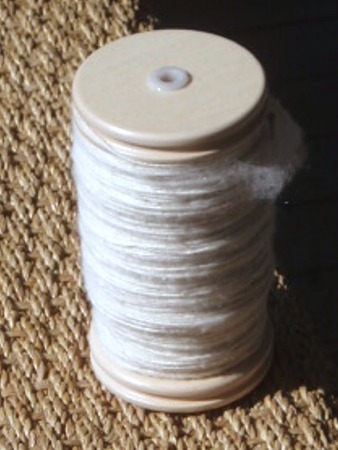 I spent nearly two hours last night spinning up this bobbin of Cormo/Silk that I bought at the Oregon Flock and Fiber Festival last September. 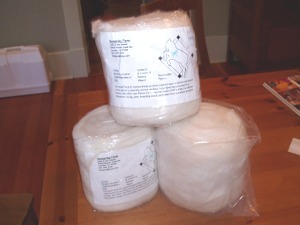 My plan is to spin 1650 yards of aran-weight yarn to make bpt. But we all know what happens to people who make plans, right? I'm driving myself slightly insane worrying the yarn will be too thick or too thin. My last few spinning projects ended up with much larger yarns than I had planned. The boys let Wes and I sleep in this morning. 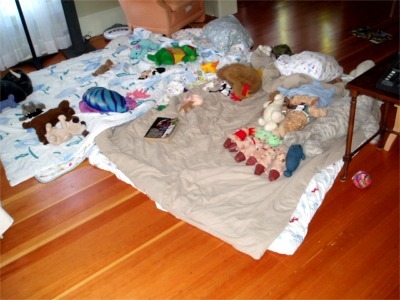 When we got up and came downstairs the living room looked like this. At least they were able to keep themselves entertained.